Socialism is about economic redistribution. In a previous article I distinguished it from statism, a term that applies to non-redistributive government intrusions into our lives. While statism has existed in various forms for as long as government has - all the way up to unmitigated tyranny - socialism is a relatively new invention. Economic redistribution for egalitarian purposes is a 19th-century invention, with strains of its roots back to the 18th century, but it did not get its full-blown modern format until the early 20th century. Since this egalitarian government, which we know as the welfare state, gained its full format in Europe in the 1930s-1950s, their entire economy has slowly trended toward stagnation. As I explained in my 2014 book Industrial Poverty, stagnation has indeed set in across the continent. More recently I have demonstrated that it is only thanks to massive exports that the Europeans can really keep their tax base even within reach of paying for their welfare states. In other words, it is not surprising that both Europe and North America are perennially close to the macroeconomic quagmire of stagnation. In fact, the phenomenon I define as industrial poverty is actually beginning to set in around the industrialized world. Europe's southern rim is only one example, led of course by the economic collapse of Greece. But not even we here in the United States are safe: whenever our economy has begun showing the ailments symptomatic for an overly costly welfare state, we have used tax cuts to reignite it. Eventually, though, we run out of tax cuts, the reason being the complete lack of structural reforms on the spending side. As we maintain, and even grow, our welfare state, we will drift into the European shadow realm of economic stagnation and - down the line - industrial poverty. The latest round of tax cuts are just about now running out of steam, doing so earlier than previous cuts. In the midst of the peak of a business cycle, with less than four percent unemployment, we are now looking at an economic downhill - from a growth peak that has barely penetrated the three-percent mark. With the IMF piling on, lowering its global growth outlook, the stage is set for yet another deep recession. The "padding" in the U.S. economy is thin: the drop from today's growth rates to where our federal government's finances become critically bad, is short and hard. Due to Europe's dependency on exports, things are far worse there - with Sweden in a particularly bad shape - but that does not exactly help us. Nor does it help us that the remedy that Congress will resort to will be a combination of tax cuts and more government spending. To get our economy back to solid growth, to where it can produce widespread prosperity for all, we need to substantially, structurally and permanently reduce the size of government. Right now, the trend is in the opposite direction, which has made more people than me raise the debt-crisis alarm. It is, therefore, essential that we continue to bring evidence that shows what the origin is of our slow growth and our debt problems. Next, let us look at budget deficits, reported as percent of GDP. This is a contentious problem that Keynesians and Austrians alike have claimed to have the magic-wand solution to. Keynesians (who have not read Keynes) suggest that deficits are good for economic growth, while Austrians suggest that harsh elimination of deficits is the path to strong growth. 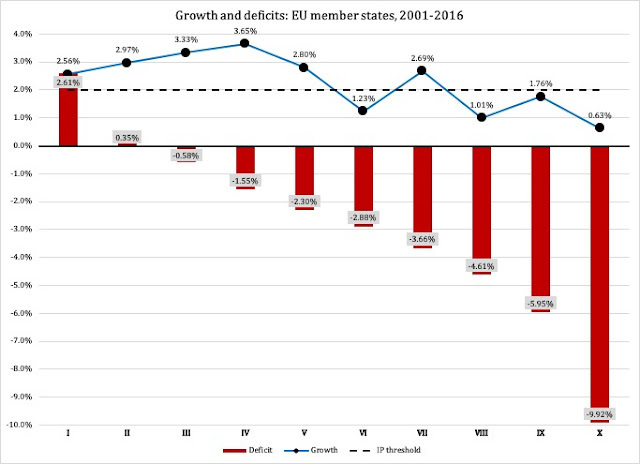 If the Keynesians (who have not read Keynes) were right, we would see a negative correlation between growth and deficits. In other words, something like what we saw between government spending and GDP growth in Figure 1. Obviously, as Figure 2 reports, we don't see that. A refutation of theory is perhaps too strong a word, but it is noteworthy that the timing of deficits and growth is not linear in either direction. Yet despite the fact that neither Keynesians (who have not read Keynes) nor Austrians are correct, we can still rationalize the results reported in Figure 2. Again, not a smooth relationship, but clearly a trend: the bigger the government, the deeper the deficit. There is no doubt that big government suppresses economic growth. It does so through taxation that lower both consumer spending and capital formation; through regulations associates with its taxes and spending programs; and through spending that distorts free markets, discourages workforce participation and hampers career development and risk taking. Slow growth, in turn, slows down the growth of the tax base. Over time, large, mature welfare states become chronically dependent on budget deficits, which explains the triangular relationship between slow growth, big spending and large deficits. However, we still have to explain the fact that GDP growth seems to peak at a moderate budget deficit; according to Figure 2 the highest rates of GDP growth are achieved when budget deficit are approximately between 0.5 and 1.5 percent of GDP. When deficits turn into surpluses, growth actually seems to suffer. The explanation is in the "kink" in the government-spending function in Figure 3, but the reason is not directly in the size of government. The problem is in policy, specifically fiscal policy: in modern welfare states, budget surpluses are not the result of policies to limit government, but policies to pay for government at all cost. 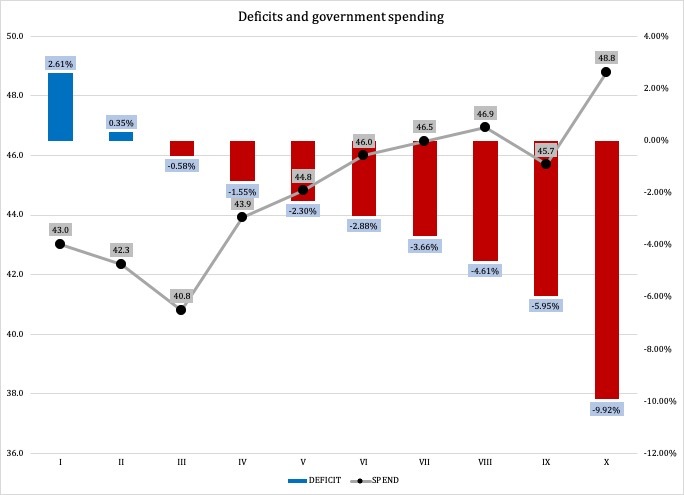 The Greek crisis is an outstanding example: after years of extreme austerity measures, the Greek government was able to turn a runaway budget deficit into a small surplus. The price, of course, was the loss of 25 percent of the Greek economy, but they were able to save enough of the welfare state to apparently make it worth the while. Yes, that's the key: it was a deliberate policy to turn deficits into surplus, even if it means suppressing GDP growth. Taken in smaller doses all over Europe the past ten years, similar austerity measures have aimed to restrain, restrict and retreat the private sector in order to transfer more and more resources into an ailing, unsustainably large government. 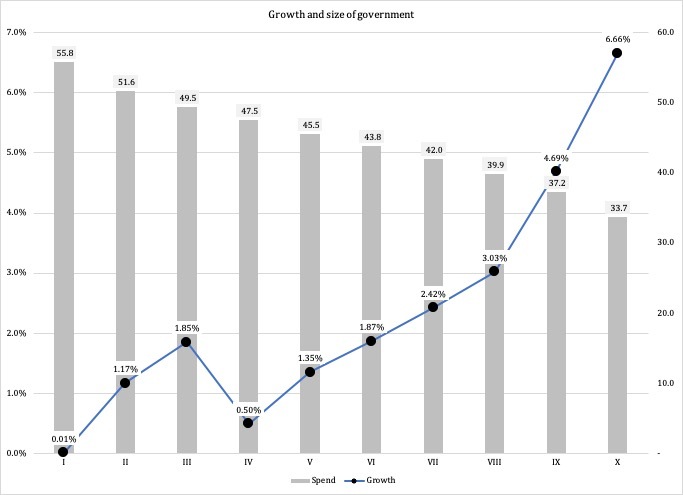 Figure 2 takes the entire spectrum of austerity policies into account, from mild to destructive, thus producing the downward slope in growth associated with budget surpluses. Figure 3 corroborates this observation with an upward kink: here, budget surpluses are associated with relatively larger government spending. The austerity measures have thus been successful: government has been preserved - at the price of a crippled, stagnant private sector. America has yet to have an encounter with the kind of socialist austerity Europe has lived with for a long time now. When we get there, though, it is going to be a terrifying experience. Unless, of course, Congress gets its act together and starts reforming spending. We do not need austerity. We need fiscally sustainable government.